Donny was so funny tonight. He was naughty just so I would spank him and out him in adult diapers! Can you believe that! He actually LIKES it! As soon as I pulled down his pants I saw his little pecker standing straight up. Well, it’s a punishment! He’s not supposed to LIKE it. He’ll end up being bad all the time to get more punishment. I never thought I’d have a boyfriend who gets off on being treated like a baby – I only used that because it’s what my Mom uses on my brothers and it works so well with them! So I had to come up with something different. I had him over my knees when I saw it and the idea came to me. I had to actually laugh at the absurdity. You See He Is a Baby Furry, So What I saw was the cat dish ….. I told him to go get the Sunday newspaper!!! So then I had him get on all fours on the sofa and I smacked his backside over and over with the newspaper, yelling, “Bad kitty!! Bad, bad kitty! !” Then I put him in that old sleeper costume I had – the cat one – and made him crawl on all fours all over the floor. I even made him lick my legs! By the way – that has definite possibilities. He said he was thirsty, so I put water in a bowl and made him lap it up. He had to go to the bathroom, so ………. yep! I let him open up the kitty sleeper, but he had to stoop over the cat litter to pee! Finally, I let him curl up on a rug beside the bed. Just one thing though. After that, I started petting him, and now …. he’s actually purring? 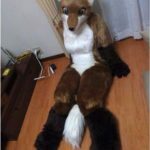 So it looks like maybe I will need to find a different Furry Fetish punishment altogether!